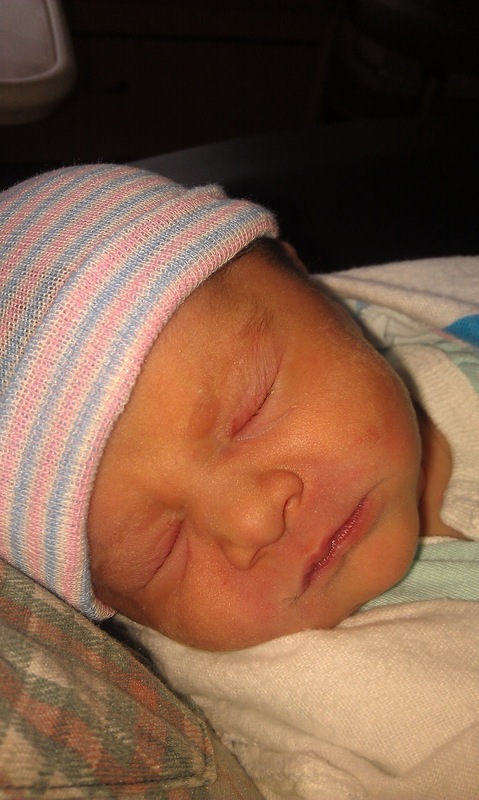 We welcomed our daughter, Matilda Gail, on January 1, 2013. A New Year’s baby! 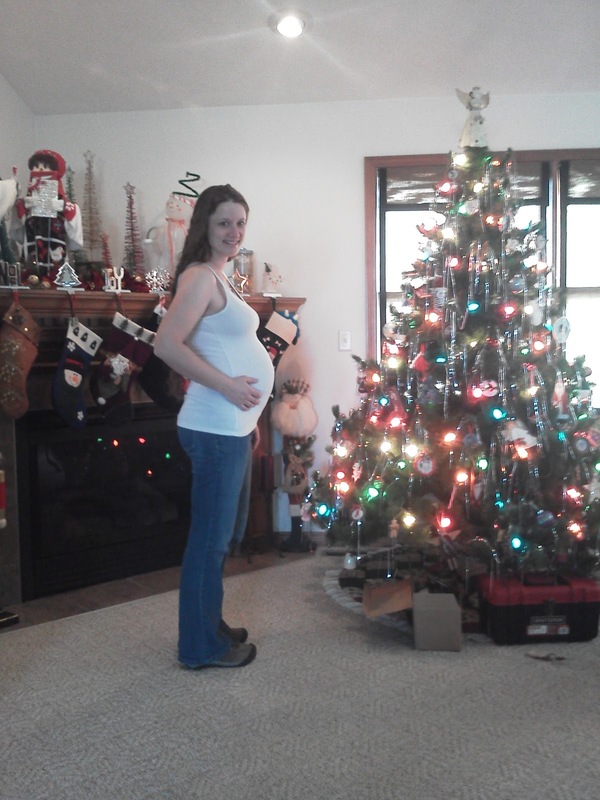 Which was just a little bit of a surprise, considering she wasn’t due until January 22. 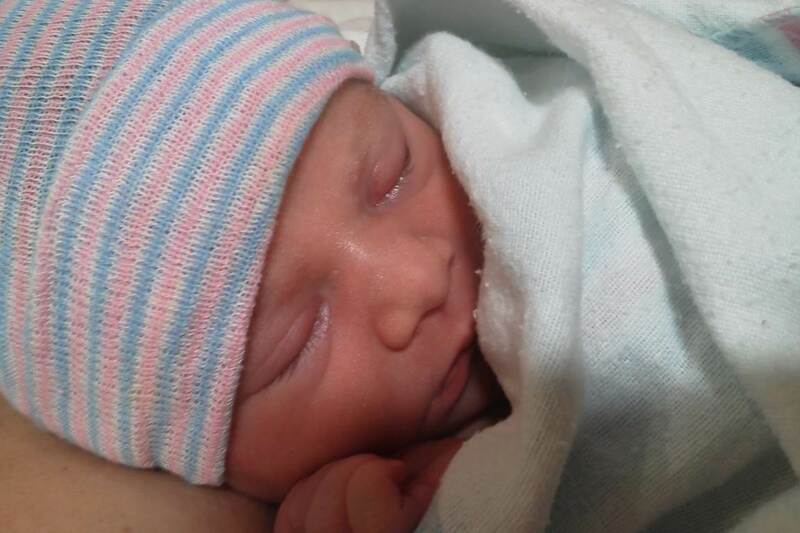 She was in a rush in more ways than one, and I thought I’d share her birth story here because I want to remember every detail. Yep, it was that amazing. But, I should warn you, this is likely to be very long and include the word “placenta.” Read at your own risk. 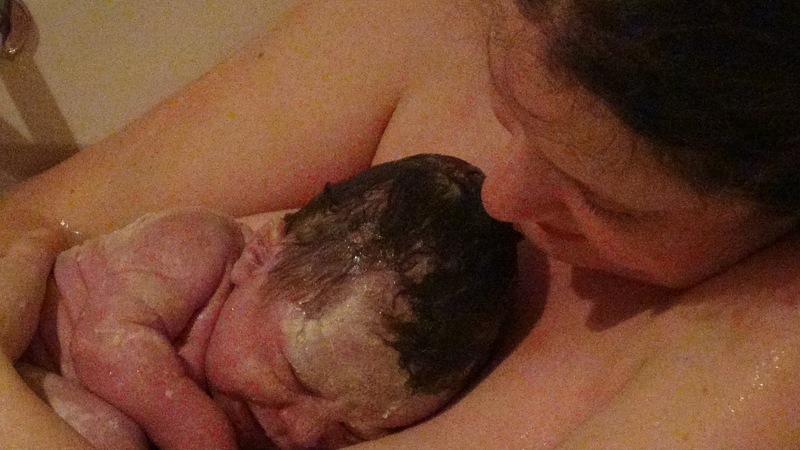 We are very lucky to have a midwife unit in our local hospital, so that is where we’d decided to deliver. 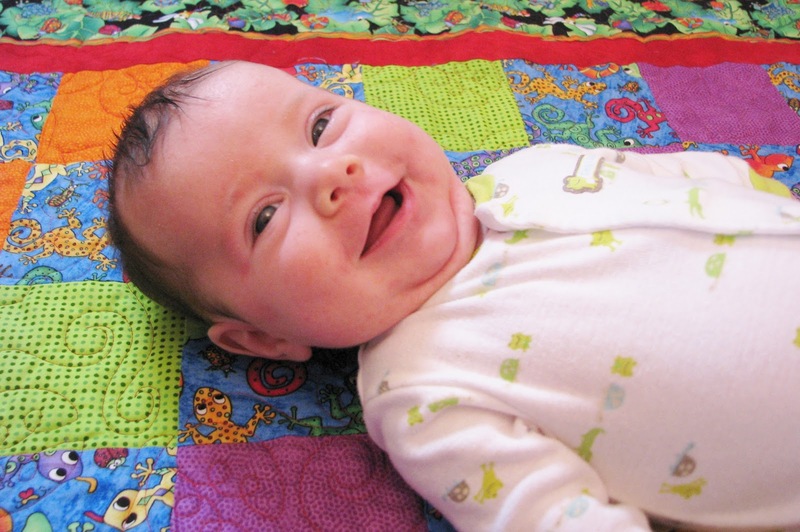 My hope was to have a natural birth, with minimal interventions. 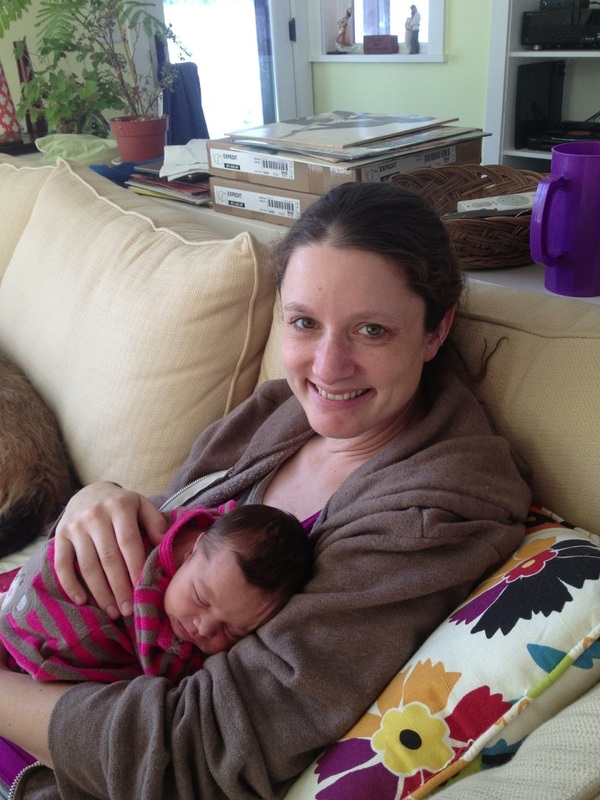 But, never having done this before, I was also trying to keep an open mind and realize that this was something that I wouldn’t necessarily be able to control – and the only important thing was bringing home a healthy baby in the end. Brandon and I attended a New Year’s Eve party on 12/31, with no idea of what was in store the next day! I felt fine that evening, except for a backache at the end of the night from standing up for several hours. Brandon gave me a back rub when we got home, and we joke that he must have hit the “eject” button by accident. I woke up the next morning at about 7:30am with VERY mild contractions – like, I thought they were still just the Braxton-Hicks I’d been having like crazy, but there was also the slightest bit of a period-like cramp with them. I timed them for a while, and they were 8-9 minutes apart, but so mild that I thought it was just false labor. I didn’t even wake Brandon. He got up at 9:30 or so, and I said “don’t freak out, but I’m having these contractions, but it’s probably nothing…” haha! Interestingly though, I got VERY WORRIED that we hadn’t yet washed the newborn-sized cloth diapers we planned to use – so Brandon got up and did a load of laundry first thing. I guess unconsciously I may have known something was going on! We had breakfast and took it easy the rest of the morning; I just laid on the couch that morning and looked at things on my computer. Then at just about noon on the dot… my water broke! It was one of the strangest sensations I’ve ever felt. I jumped up and leaped over to our slate hearth, so I wouldn’t soak the couch or my beautiful orange rug (yes I was worried about the rug). I shouted “my water just broke!” and poor Brandon was like “are you sure?” Once he walked over to me I am pretty sure he was sure too. I’ll leave it at that. At this point Brandon went out to get pads, since we didn’t have any in the house (three weeks early!) and I was going to need them for the sake of our car upholstery. In his my-wife’s-in-labor headspace, he decided to drive to a Meijer on the other side of town – in the meantime, passing a CVS, two Walgreens, a Target, and a couple grocery stores. Poor B. Strangely enough, I was in such a zone that I had no idea he was gone for so long. 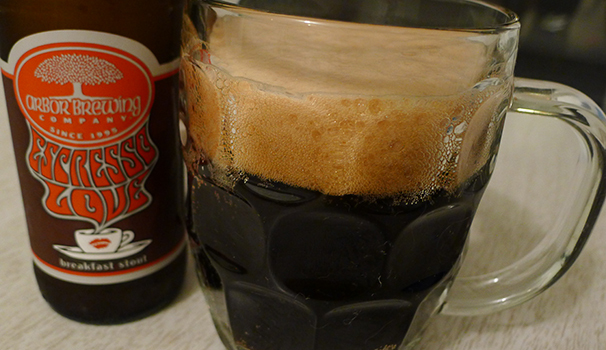 Oh, he also picked up a six-pack of one of my favorite beers, so I could have one after the baby arrived. I planned to labor at home for a while, so Deb came over at 2 or 2:30 to assist me. I wanted to hold off going to the hospital until things were really moving along (getting there at 4-5 cm dilation can help avoid labor stalling out, and subsequent interventions like pitocin). It was very hard to figure out what stage I was at, because I was having a really weird pattern of contractions. They were only ever 30-45 seconds long, but right on top of each other (often less than a minute between them), whereas a more typical pattern would be one minute contractions, four minutes apart. The contractions had also gotten very intense very quickly. We decided to leave for the hospital a bit before 3:30pm. At this point we had an INTERLUDE OF ADVENTURE!! I should really let Brandon tell this part, but let’s be real, this post is already long enough. Brandon had been packing up the car, and on one of his trips down he heard the ominous sound of a car spinning out on the icy, hilly, one-lane driveway that leads from our house to the road. Thinking that Deb had gotten stuck, he ran out to try to help push her car out. He got there and found it wasn’t Deb, but a friend of the neighbors. He asked if they needed help, but they were going to try backing down the hill and getting a bit more speed to try again. He asked them if they’d mind waiting five minutes… at which point I imagine they were mildly annoyed, until he remembered to add “because my wife is in labor and we need to go to the hospital RIGHT NOW!” That probably helped put his frantic demeanor in context, and they backed down the drive and waited so we could get out. So, no problem, right? We hop in the car, start to back out of the garage, and hear a CRASHBANGSCRRRAAAAAAPE. We got to the hospital around 3:45, and the nurses in triage seemed to be taking FOREVER… chatting to each other, wandering in and out of the room, checking the fetal monitor hooked up to me. I know I was probably only there a few minutes, but the last contraction in the car, and the few I had in triage, had started to feel really different… like I needed to push. Finally I mustered myself out of my fog enough to say “I feel like I need to push!” No one seemed to believe me except for Deb. The nurses were like “oh no honey, you can’t do that yet… here, we have to monitor a few more contractions, just lay still.” I AM GOING TO HAVE A BABY ON YOUR TRIAGE FLOOR, JERKS. Luckily I remembered a secret code phrase that a friend had told me, that had worked magic during her super-fast labor (thanks, Jean!). If no one believes you, tell them you need to poop. No joke, I said those words (even though they weren’t exactly true) and all of a sudden, like magic, there was the midwife. She checked me and I was at 8-9 cm dilation. Well well well. I TOLD YOU I HAD TO PUSH. At this point there was a kerfuffle about whether they had time to get me to a birthing room, or whether I should just deliver in triage. Deb stepped up and said I’d like a birthing tub, and really helped expedite things to get me moved to a birthing room and into the water. And lo, it was glorious. It made the pain so much easier to deal with. 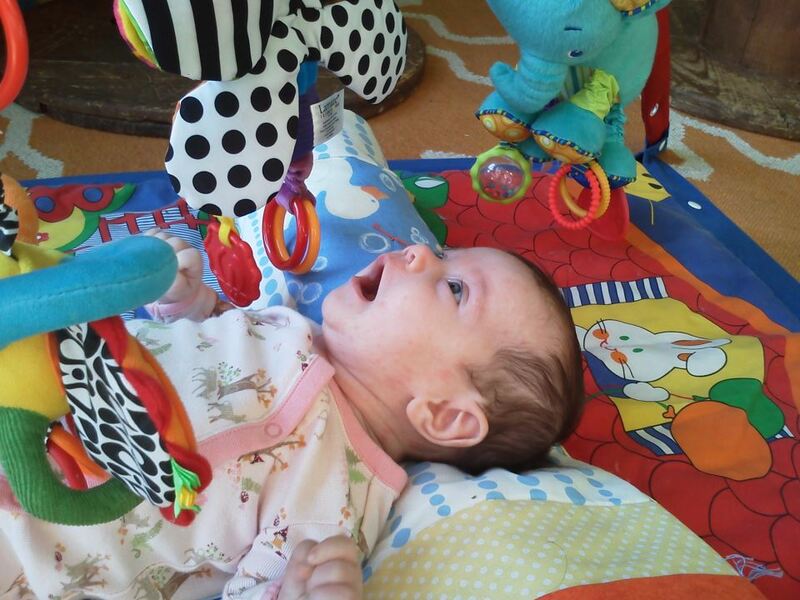 The pushing stage was really hard for me – I felt so tired between each contraction. At one point I heard Brandon say “wow, she has a lot of hair!” That somehow really focused me – like, “wait, no fair, I want to see her hair!” Haha. In the next couple pushes Matilda Gail was born in the water, at 5:11pm. I had been so worried because she was early, but the first thing I heard was the midwife saying “wow, she’s not that small for a 37-weeker!” (She ended up weighing in at 6 lbs 9 oz). They put her on my chest, and she was so alert – looking all over the place – and then she just WAILED and I knew she was OK, and I just couldn’t stop looking at her and crying. It was the most amazing moment of my life. They got us out of the tub for the placenta delivery, but I got to keep holding her – they did just about everything they needed to do with her on my chest. I really can’t describe how amazing I felt – like I was high, like I was the strongest person in the world, just in awe of this amazing little person. I still get teary just thinking about the experience. I am just overwhelmed with thankfulness about how well it went, and how healthy and amazing she is. 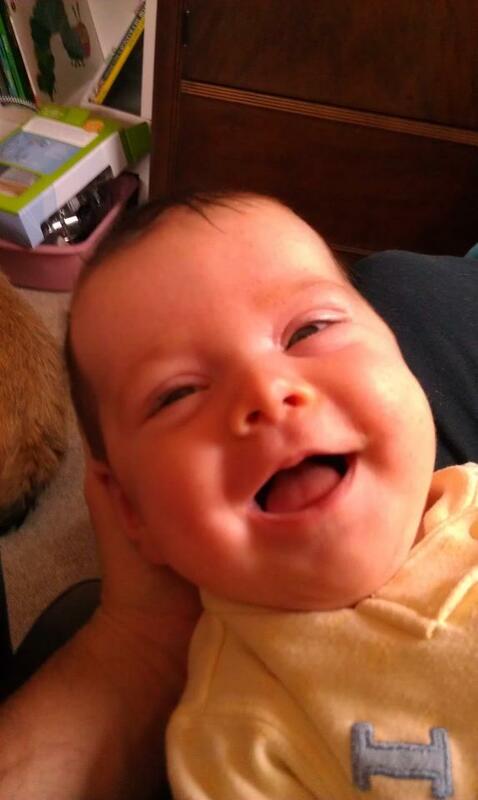 TL;DR: I had a baby, and she’s awesome. That is so beautiful. I love how your hubby was all supportive and panicked! We missed out on that because of the scheduled inducing (pre-e). Loved reading your story. Thanks for sharing! I love your story! I'm crying! I had my second daughter just 5 days after you, on January 6th. I also almost gave birth to her in triage. It was the most hilarious thing. I still can see the nurse and my husband running down the hall pushing my bed into L&D! Yay! Glad it went so fast for you. A wonderful experience. Congratulations! I love that smile in the last pic. Thank you, trina! B was an incredible support the whole time – something I should have emphasized more above. I spent some time kneeling in the tub by him with our heads together, holding hands. Really special moments. Have you written up your story somewhere? Weird, my reply to you just got eaten by the interwebs… anyway, thanks! 🙂 I knew we were due really close to each other. I've loved seeing the pics of little Mina on your blog (and I love her name!). Was your labor with Franca also super fast? 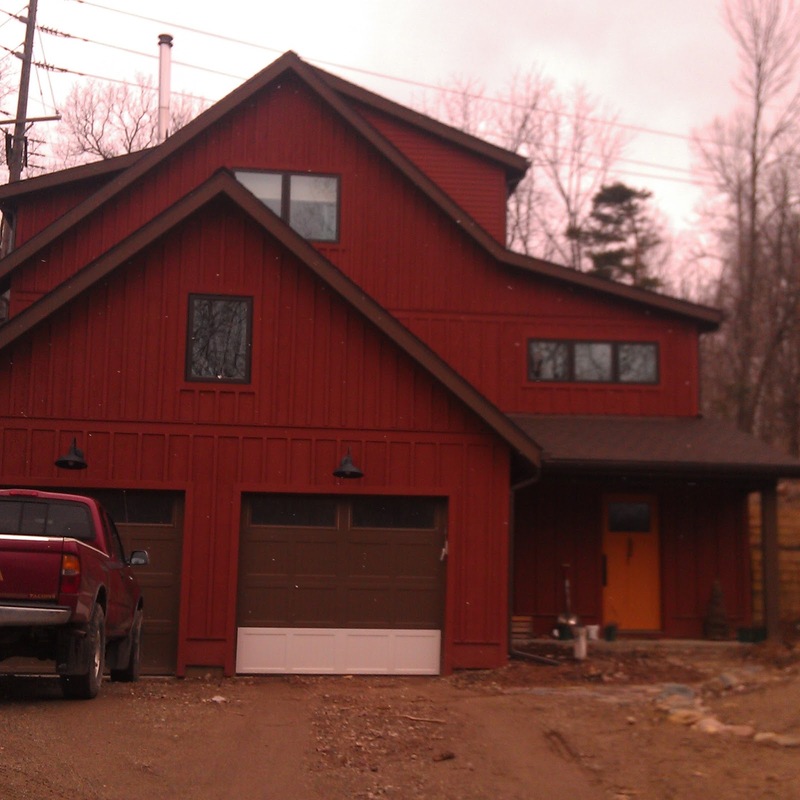 Can't wait to see what you guys do with the new house plans – so exciting! Congratulations! She's lovely and such a wonderful humorous story. 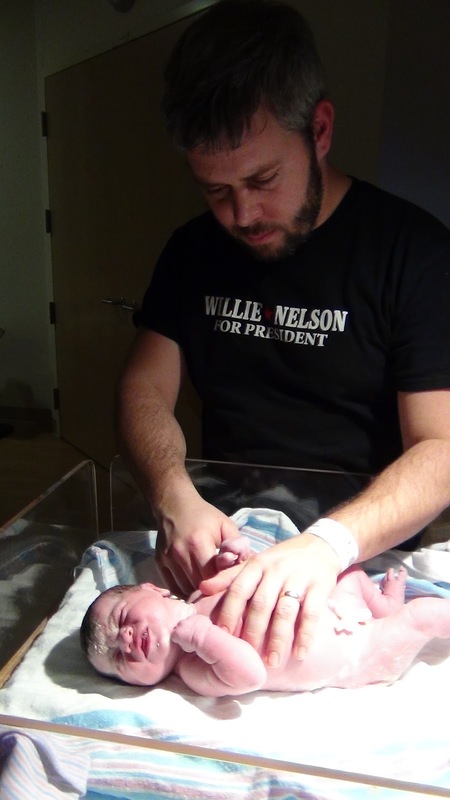 I especially love the Willie Nelson for President shirt 😉 btw, are you liking the cloth diapers? I'm a bit of a CD addict.